24/08/09 - Accident – Vic-sur-Seille, Musée départemental Georges de La Tour – The Orchidea Urn (Phalaenopsis) by Emile Gallé, one of a pair donated by the city of Paris to the Tsarina Alexandra Fjodorowna in 1896 and belonging to the Hermitage Museum in Saint Petersburg, has raised a heated controversy. Currently on exhibit at the Musée départemental of Vic-sur-Seille in the retrospective on this artist (see article in French), the vase in fact cracked while in the display case where it was presented (ill.). The accident was noticed on 22 July. According to apress release from the AFP dated 13 August and generally announced in the media, the Russian museum “is very shocked by the attitude of the French party which chose to inform the press before the Hermitage Museum. This attitude brings into doubt several projects programmed for 2010, the Year of Russia in France”. Again according to Gabriel Diss, when the incident was discovered at 10.15 on 22 July during a visit/lecture (knowing that earlier that same morning the object was intact), an e-mail was sent to Madame Anisimova and a formal report was established. Then, the next day on 23 July, a registered letter requesting acknowledgement of receipt was sent to the Hermitage management, signed by the Directeur des affaires culturelles du Conseil Général de Moselle. At the same time, the insurance companies involved were also informed. The accusations by the Hermitage and the threats to reconsider the upcoming exhibitions organized for the celebration of the Russian year in France are thus very surprising. When we visited the Gallé exhibition, we were able to see for ourselves that the works in question were in display cases placed against a wall and that they were presented in normal conditions of lighting and temperature. Furthermore, we saw the e-mail sent to Madame Anisimova, dated 22 July at 19.06 and which proves that the Hermitage was notified immediately. 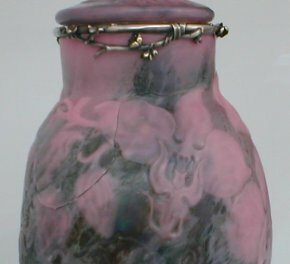 We find it hard to understand that this regrettable incident has caused such a controversy with French museums, particularly since the Hermitage’s accusation of not being informed on time is apparently false and that the responsibility of the Musée Georges de La Tour for the damage to the vase is far from being a proven fact. The question is, how then can the vase have cracked when it was conserved under normal conditions ? For the museum in Lorraine, the accident was caused by taking it apart at the Hermitage for cleaning before the exhibition. The silver ring encircling the crystal neck may have put too much pressure after being put back, and over time caused the crack seen in the photograph. The fact that the crack starts at the neck and returns there might seem to confirm this hypothesis.